robin hood: Alan a Dale, Outlaw of Sherwood. Alan a Dale, Outlaw of Sherwood. Above: Alan A Dale in his latter years. From "Rogues of Sherwood Forest" (1950). Alan A Dale makes relatively few appearances throughout the films and television programmes devoted to the legend of Robin Hood. But any schoolboy growing up in post war Britain would be familiar with this outlaw from his numerous appearances in boys annuals of the time. Robin Hood first encountered Alan A Dale singing alone in the depths of Sherwood Forest, despairing over the loss of his girlfriend, the maiden Ellen, to an old Knight. Robin took pity on him and rescued the fair Ellen during her wedding ceremony. She went on to marry Alan, who in turn became a faithful and loyal member of Robin Hoods Merry Men. Far too many films combine the character Alan A Dale with that of Will Scarlet. And yet two people could not be less alike. Alan was a good natured, even tempered woodsman, with a gift for story telling, whilst Will Scarlet gained his name partly because of the coloured fabric he might rob from the rich and wear as trophies, but mostly because because of the anger inside. 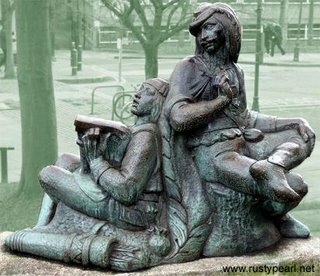 The above statue, which stands outside the gates of Nottingham Castle, depicts Alan A Dale (left) alongside Will Scarlet. Note that Alan is playing a small harp. This is correct, even though he is most popularly pictured with a mandolin, as in the Walt Disney film The Story of Robin Hood, and the Hammer films Sword of Sherwood Forest and Challenge for Robin Hood. But note also that the artist has persisted in depicting Will Scarlet as a "dandy". This is certainly incorrect. Actually hear Alan A Dale sing on THIS LINK. For more information about Alan A Dale follow this link and also visit the website Robin Hood Pictures at http://robinhoodoutlaw.blogspot.com/ .To see where Alan A Dale met Robin hood in Papplewick, see THIS LINK. Robin Hood plaques and statues. Robin Hood 1950's TV series, Richard Greene. Robin Prince of Thieves, film review. Tussaud - Birt artist sculptor. Robin Hood statue, most famous Robin Hood statue.